On a visit to Montreal in 1881, Mark Twain wrote, “This is the first time I was ever in a city where you couldn't throw a brick without breaking a church window.” Over 130 years later, church spires still serrate the city's skyline, rising from every neighbourhood and borough on the island. The difference is that many of them are no longer used as places of worship. Over the last century in Quebec, close to 850 churches have been closed, sold, or converted to suit and adapt to changing demographics. Most of these changes occurred after the Quiet Revolution, in a rapid and sweeping secularization of Quebec society. 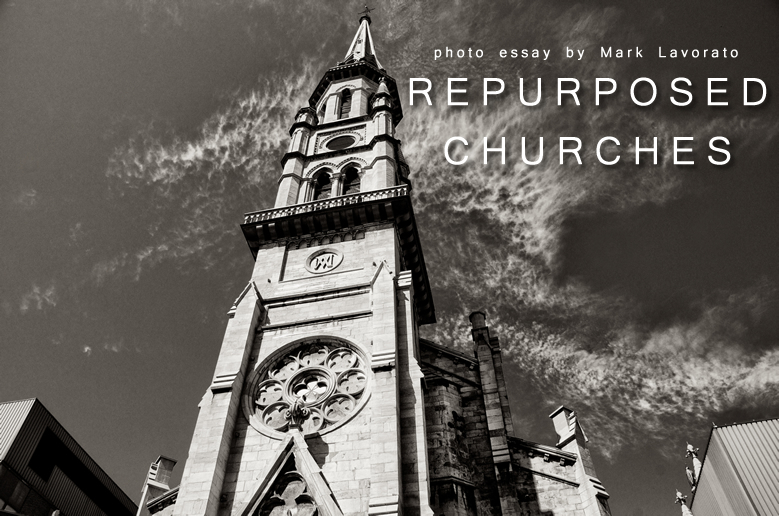 Today, a number of these churches sit empty and unused, while the communities around them weigh in and propose projects on how to best utilize the spaces they've left behind, and work out who, if anyone, will pay for their renovation and maintenance. Other churches have simply been taken over by competing faiths, by religions and sects that still have enough of a following to pay for both the buildings and their upkeep. While still others have been sold, then refurbished to serve completely different purposes altogether, even if they often retain the façade and outward appearance of a church. In my last photo essay, I focused on the state of the Church as an institution in Montreal today, 50 years after the Quiet Revolution. In this photo essay, I'll examine some of the physical spaces that this once powerful institution has lost, and which now boast new, and often innovative, architectural designs and purposes. The Montréal Review is an online publication on current affairs, books, art, culture and ideas. The Montréal Review is owned and published monthly by T.S. Tsonchev Publishing & Design, Canada. The Montréal Review welcomes letters to the editor, submissions of short stories, poems, nonfiction articles, and opinion.